UWA has policies and regulations covering the use of information services and systems at the University. The Policy & Compliance Team will review and discuss the request or issue and consult with relevant stakeholders to see whether a new policy, or revision of an existing policy, is required. You will be kept informed of this process. If a new policy, or revision of an existing policy, is indeed required, the Policy & Compliance Team will conduct wider stakeholder engagement to address the issue in the best way possible. Once this process is completed, a draft policy will be presented to Management for endorsement. The governance process for ICT-related policies requires additional levels of advice and endorsement to ensure the eventual policy is of the best possible quality. This is reflected by the Technical Advisory Group (TAG), which reviews the policy and provides advice to the Strategic Information Technology and Information Management Committee (SITIMC). The SITIMC will provide final endorsement of the policy, after which it is signed off by the Vice Chancellor and published on the Governance website. 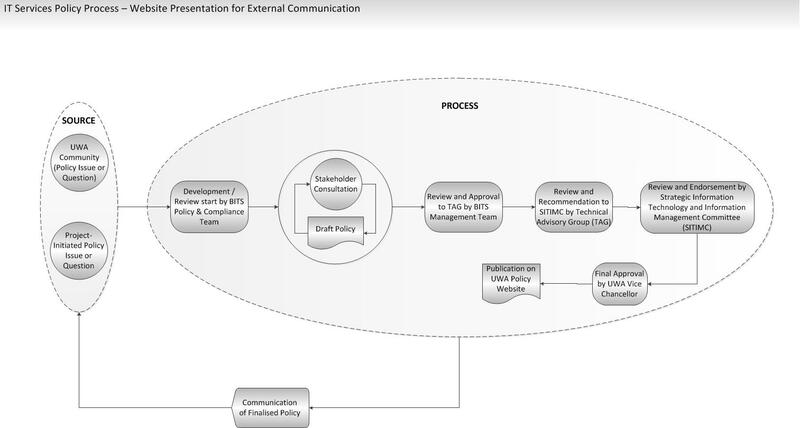 The IT Services policy process has various levels of research and stakeholder consultation to ensure alignment with other leading sector institutions, and to raise and maintain awareness of policies and procedures, and create a level of buy-in. Final process outcomes are communicated to ensure that all relevant parties are able to comply with the approved changes. The Intellectual Property Regulations set out the principles that apply to ownership of intellectual property created by students or staff of the University including in situations where agreements have been entered into with sponsors. Both sets of regulations are published in The University of Western Australia Calendar. Access to University Buildings and Electronic Systems - this policy defines Category 1 and Category 2 staff.